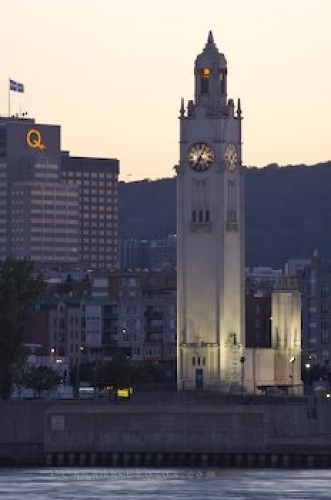 Along the St. Lawrence River in the Old Montreal Port in Quebec, Canada as the sunset lighting begins to fade, the illumination of the Clock Tower becomes noticeable. The lights at the base of the tower shine half way up the building as the face of the clock and the lantern at the peak are lit. Built between 1919 and 1932, the Clock Tower is a landmark for the entrance to Old Montreal Port and the illumination of the tower at sunset acts as a lighthouse providing help to passing ships. Inside the Clock Tower, an interpretative centre has displays which retrace the history of Montreal and the lookout at the top provides a scenic view of the city and the surrounding area. Picture of the illumination of the Clock Tower at sunset in Old Montreal Port in Quebec, Canada. ... Port at sunset seen from across the St Lawrence River at the Navette vers le Vieux-Port on Ile Sainte-Helene, Montreal, Quebec, Canada.